EDIT: Giveaway is officially over. Congratulations to Brittney House for submitting the randomly-chosen 624th entry. The solstice may not occur until June 21, but summer season starts every Memorial Day weekend in my beach town. A local nail salon is advertising a summer special for $20, but I can apply at least two full manicures from a sheet of Jamberry nail wraps for less money. And not have to fight the traffic or sit in a waiting room! 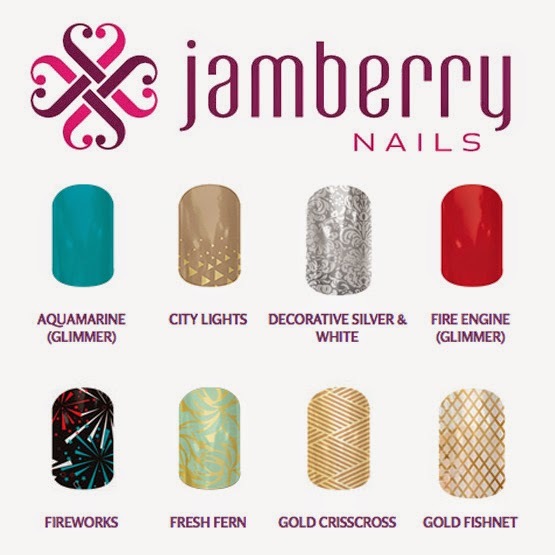 One of you will get an even better deal on nail art to freshen up your summer fashions - Jamberry consultant, Denise Boudreau, is giving away a $25 gift card. If you've ever won any of my giveaways, you can actually thank Denise - she was the first to ask me to host a jewelry giveaway. I may have never started offering such pretty prizes if not for her! She's also helped me earn free nail art by buying sheets through my Jamberry parties before becoming a consultant. 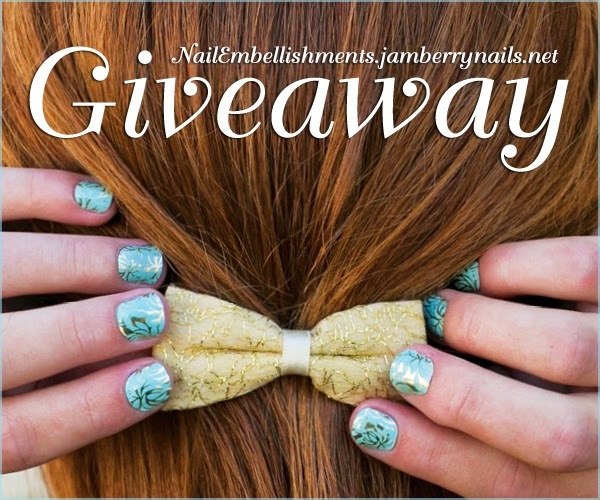 You read right - you don't have to win a giveaway to get your hands on free Jamberry products! They offer hostess rewards - the more your friends buy, the more free stuff you earn. Don't be shy, email Denise at nailembellishments@gmail.com to throw your own online party - it's even worth 5 additional entries! Use the Rafflecopter below to enter to win giveaway before 11:59pm EST on June 25, 2014. At this time, Jamberry wraps are only available for sale in the United States, Canada, Puerto Rico and Guam, thus you must be a resident in one of those countries to officially enter. Be sure to leave the mandatory comment on the blog post with the same name you use to fill out the Rafflecopter - all entries by winner must be easily verified or a new winner will be chosen. Not including usernames when asked will also get you disqualified. I love the VintageChic nails! They are all beautiful designs! Have a terrific night! I love the vintage chic! I love the fresh fern the best! They sell a lot of great designs but I really like the Born to Sparkle the best. hi, I would love to try out jamberry! I'm poor. Please pick me! Love the clear backings and bright colours! That city lights one is great! That's so cool that she was your first sponsor for a giveaway (Thanks, Denise!). I love the vintage chic. I love the Purple Ombre. Seascape is my new favorite - Born to Sparkle is awesome too! I like the LAZY AFTERNOON design. My favorite are the lacquers! I like the Vintage Chic. I like the WHITE CHEVRON design. I love the Reminisce (solid). I love the silver and white for my granddaughters!!! My favorites are the entire Mommy & Me sets, I have two daughters and they would LOVE them! I love the OSU BUCKEYES nails! I like the Turple Ombre. OMG, love the VintageChic nails! 2 fingers snap girlfriends. I really like diamond dust sparkle. I like the raspberry sparkle. I like the mint chevron design. I like the FRENCH TIP BOWS (SHORT). I really like Aztec Evening. I like the Raspberry Sparkle! Poolside Glow Lacquer Set--Love to have! I love the Fireworks nails !!!! I like the Broadway Nail Design. My favorite style is the Mini Polka & Tropical Mirage junior nails for my daughter. I love the Feminine Flair nails, they are so pretty. I love the Turple Ombre! I think I'd pick America since the 4th is coming! The mom and me line is so cute! I like the MINI POLKA & TROPICAL MIRAGE! the "city lights" is a great neutral with a twist - I love it! I would love to have these to my collection of nail art! What a great contest! I really like the white chevron design. My fave is the born to sparkle....too cute. I like the rose gold metallic. I love the FIREWORKS ones they would be perfect for the 4th! I LOVE the AMERICA design. It is so cute for this time of year. I really like the vintage chic.